Many patients are in need of custom dental restorations, but the multiple appointments required to receive them can be a drain on busy schedules. Here in Manchester Center, Dr. Catherine Cech is proud to transform this process for the better with state-of-the-art CEREC technology. Now, all-ceramic crowns, onlays, inlays, dental veneers, and other restorations can be designed, crafted, and placed over the course of a single, convenient appointment without sacrificing any of the quality you deserve in the process. Contact us today to schedule your first appointment with our team, or if you have any questions. CEREC is made up of computer-assisted design (CAD) tools, as well as an in-office milling machine that creates the finished restorative product while patients watch. This revolutionary technique can actually reduce the cost of your treatment overall, and many anxious patients feel relief that they can simplify their treatment down to a faster timeframe. 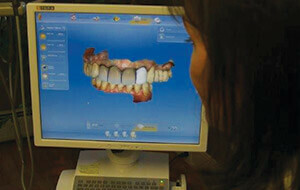 CEREC is the right treatment choice for virtually anyone who’s in need of a beautiful, durable restoration. If you have a history of damaging your ceramic restorations with grinding/biting, Dr. Cech can provide a custom mouthguard to better protect your improved smile. Most CEREC-created restorations are projected to last for 10 years or even longer with the right amount of professional maintenance and homecare. Dr. Cech will prepare the tooth and take pictures of it with a high-quality camera and medical grade computer. The CAD software allows our team to examine the 3D images of the tooth from every angle and design the ideal restoration for your unique smile. The milling device creates the permanent restoration from Dr. Cech’s specifications, using a block of ceramic that most closely matches the patient’s natural smile. Once the restoration is finished, Dr. Cech will make any necessary adjustments and then cement it into place.